Six soldiers from an elite Libyan army unit have been killed overnight by masked gunmen in the restive eastern city of Benghazi. A source at the army's command centre in the city told the BBC that the gunmen had attacked the headquarters of a special forces unit elite. This then led to heavy fighting in the area, he added. 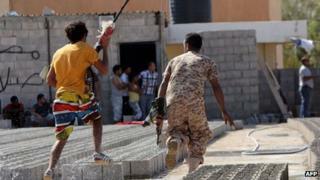 Benghazi was the centre of the uprising that toppled Muammar Gaddafi's regime in 2011. It has become increasingly unstable amid clashes between militias made up of former rebels and the regular forces of the new authorities. Militias with different tribal and ideological links control parts of the city, which has seen a wave of attacks on government security forces. The official Facebook page of the special forces shows gruesome images of some of the soldiers who died in the early hours of Saturday morning. The BBC's Rana Jawad says that two of the men who died appeared to have been summarily executed after being taken hostage by what the unit described as the Takfir group - a clear reference to Islamist militants. The latest clashes mark an escalation in the attacks against the special forces unit since they were deployed in the city about a month ago. Previous incidents included their checkpoints being targeted in drive-by attacks. Radical Islamists were blamed for an attack on the US consulate in Benghazi last September that killed four Americans, including ambassador Chris Stevens. Benghazi has also recently been the scene of anti-militia protests, which saw residents demanding they be dissolved attacked and killed by militia members.